Super Gooey Chocolate Drops - Eat. Drink. Love. 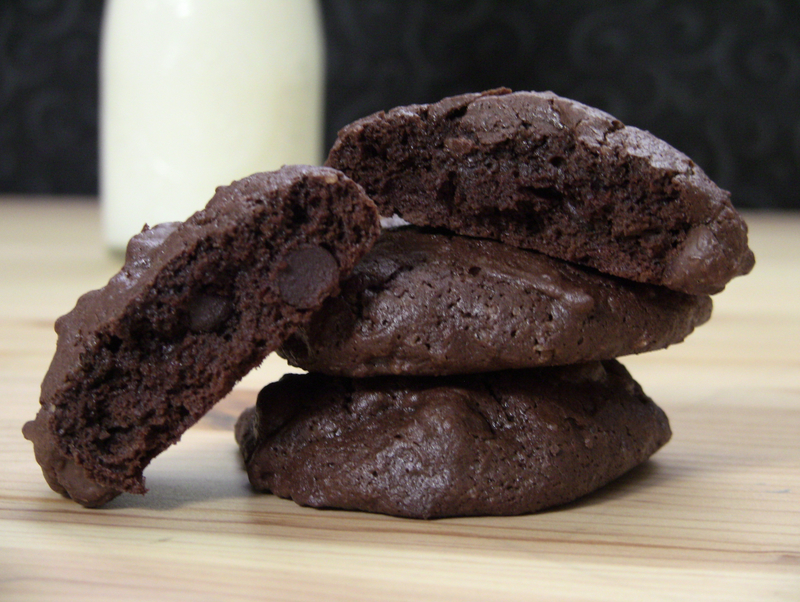 I hope y’all like chocolate because with these awesome gooey chocolate cookies, you are gonna get a lot of it! I am bringing you another recipe from my bridal shower cookbook! This amazing cookie recipe comes from my sister-in-law, Carrie! Carrie put a few delicious recipes in the book, but this cookie recipe just sounded too good to pass up! These cookies have lots of chocolate baked right into the dough and with the addition of the ooey gooey chocolate chunks, these are sure to satisfy your chocolate cravings and then some! The only ONLY thing I might change next time is the cinnamon. I liked the flavor it added, but I’m not sure if I added too much accidentally or what, but I did feel it was a little much so next time I think I will cut the cinnamon in half or just leave it out. 1. Preheat the oven to 350 degrees. Put the butter, unsweetened, and semi-sweet chocolate in a bowl. Microwave until soft and mix together (or you can use a double boiler). Mix the light brown sugar, sugar, vanilla into the chocolate. Add the eggs and buttermilk and beat vigorously until the mixture is thick and glossy. 2. In a separate bowl, mix the flour, cocoa powder, cinnamon, and salt together. Add the dry ingredients to the wet ingredients and mix until well-combined. Stir in the chocolate chips or chunks. Drop the batter in heaping tablespoons on a lined baking sheet. Bake for approximately 13 minutes or until cookies are soft and fudgey inside..
OMG these look so dense and chocolatey and chewy! Please send a dozen over my way. Im totally craving chocolate now. Thanks, Ann! I love the recipes too! I’m going to keep them coming!! Chocolate is something which is never enough!! More…the merrier!! These do look like a wonderful treat-love the texture as well as those chips in there. I have saved this gem of a recipe-Carrie knows her chocolate! Cool idea bridal shower recipe book-I will keep that in mind. Thanks, Tina! I hope you like them! Looks great…I really like the combo of cinnamon and chocolate but I know some people really don’t. Thanks, Emily! I liked it, but it was a bit much for me. I think I would like them better with half the amount of cinnamon. Though I am not really crazy about chocs but this cookies you look looks so tempting and wanting me to try it. Thanks, Lizzy! Yeah, I think I will try them without it next time, or cut it in half! Oh my wow! These look so rich and decadent. I would love to be dipping one (or three) in my coffee right now! Thanks, Cassie! They are really tasty with coffee!! Cinnamon + chocolate-I’ll take it ;) And these do look super moist! Thank you, Sandi! They were really moist! Oh my god in heaven. These look so incredibly soft, moist, chocolately, and OMGI’MDROOLING. …Sorry. Let me put myself together here. These amazing. Period. Haha! Thanks, Colleen! They are drool-worthy! wow! I just posted chocolate chip cookies too! These look absolutely scrumptious! Mmmm. 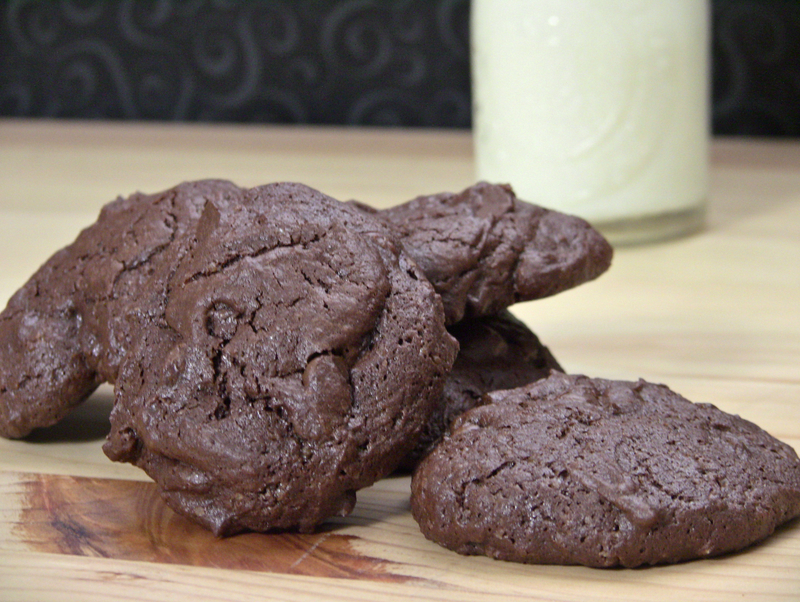 These decadent, chocolatey cookies require a tall glass of milk, for sure! :) Does the cinnamon give it a spicy kick? Deeelicious! Thank you, Cristina! A glass of milk is definitely recommended with these cookies! I could never make these because I would end up eating the whole batch! That cookbook you got as a bridal shower gifts is really one of the best gifts I have heard of. It is so great that you have such a wonderful collection of recipes from special people in your life! Thanks, Alyssa! I froze half of the batch so I wouldn’t eat them all at once! lol! Holy cow, there should be a law against this type of cookies. I feel my blood sugar raising and pounds stacking around my waist line just by looking at them. Oh, these cookies would be in a big trouble around me, so hard to resist them! Haha! Thanks, Roxanna! They are hard to resist! Mmm these look so chocolatey and melt in your mouth delicious! Your chocolate cookies really are ooey, gooey, chocolatey goodness. Love how it turned out, and adore the recipe! Thanks for sharing, and commenting on my blog! Thank you so much, Elisabeth! Oh Wow, how perfect and tempting these chocolate drops are! I loved the recipe and absolutely loved my stay here!! Chocolate overload is a great way to describe these! Thanks, Shay! You can have 4 if you want! Ooohh, yummy, now that’s a chocolate cookie, thanks for the recipe share! I can never get enough chocolate, and these sure look chock full of the stuff… meaning I must eat them ASAP! 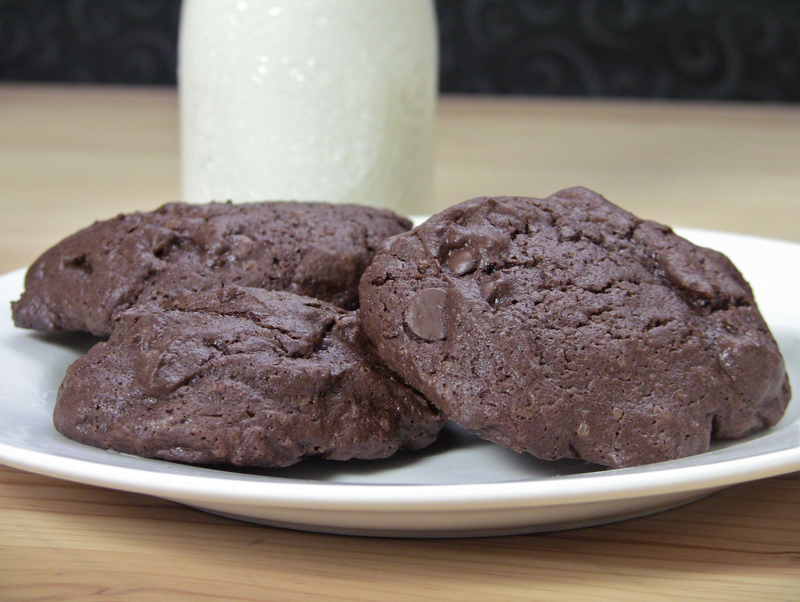 If you love chocolate, then these are the cookies for you! I don’t know, I love the idea of the cinnamon–you don’t see enough recipes with cinnamon and chocolate! Gooey and chocolate in the same sentence… perfect. I love all the cocoa you used too – it adds such a great flavor to chocolate cookies that you can’t get using just the chips. I agree! Chocolate in the batter is the way to go! That is exactly what I did, Janet! It’s much safer this way, lol. This has inspired me to make cookies this weekend. These look amazing! I love chocolate cookies! I’m so glad these inspired you! Who wouldn’t love a super chocolatey cookie YUM! Anyone that doesn’t is just plain crazy!! Double chocolate cookies are my fav (although sometimes I use I sneak in some peanut butter chips too). These look amazing. Oh, I LOVE that idea!! this is what i needed yesterday, around 4 p.m.! Oh. My. Goodness. Would you mind if I tried these? I could really go for a major chocolate intake right about now! These look amazing! I’m actually hosting a Gooey Chocolate Dessert Party on the blog tomorrow, send me an email if you want these included! another reason why I have GOT to add cocoa powder to my grocery list today! =) yum! !